Army JAG Corps veteran Whitney Bradfield recently transitioned to Florida. Her only regret: not having moved sooner. 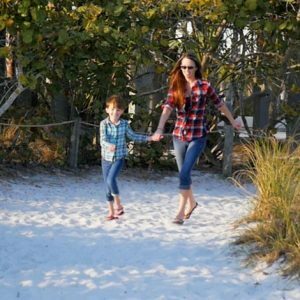 Former JAG Corps paralegal Whitney Bradfield and her eight-year-old daughter Evelyn are digging for shells in the sugar white sands of Siesta Key Beach in Sarasota, Florida—a much acclaimed spot on Florida’s southwest coast that has quickly become one of their favorite romping grounds. In stark contrast to what they would have had to wear back in Indiana to stay warm, the two are clad only in jeans, plaid shirts and flip-flops. Though the sun is low in the sky, it’s warm outside and a gentle breeze is gently rearranging Evelyn’s short cropped hair. Her mom is talking about the reasons she chose to make her new home in Florida; evidence that the decision was the right one for them is mounting by the day. After their beach adventure, Evelyn dashes over to the colorful playground that lies near the opening to Siesta Key Beach. She perches on a swing and soars, giggling with delight. Looking on, Whitney smiles broadly. This has been a fun day for the veteran and her daughter—warm, bright and active. In other words, perfectly emblematic of their new Florida life. This entry was posted in Live, Work. Bookmark the permalink.